Chinese counterfeiters are making millions of dollars selling fake Yu-Gi-Oh! trading cards to families and young children in Australia. 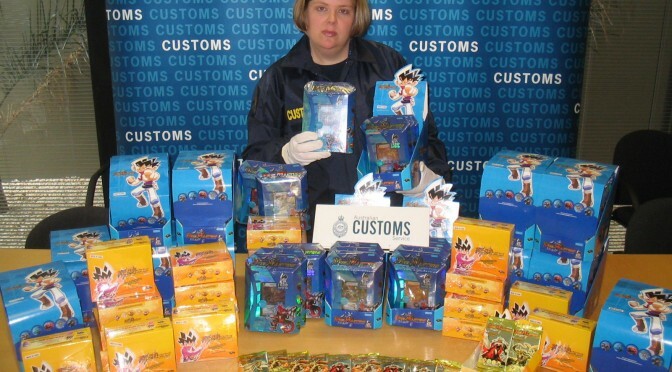 Last week, Customs in Sydney seized almost a million phony Yu-Gi-Oh cards with a retail value of about $500,000. Customs’ acting regional director, Gayle Brown, said her officers had detected 135 boxes containing more than 52,000 packs in a shipping container from China. According to the authorized distributor, Ikon Collectables, it was the third major seizure in the past six weeks. The managing director of Ikon, John Howard, said 22 pallets of cards had been found in Melbourne while another load had been intercepted in Brisbane. He says the fake cards are being sold to unsuspecting kids in markets around the country. Some were poor quality but all seemed to come from China where originals were scanned shortly after their official release and then copied. He said the cards were particularly popular with boys aged from 6-9 who liked to collect them for the pictures and to swap.